No. 1701: What makes the judgment against me a justice word is that the court has not dealt with what I and the heavenly blog are judged for, even though I disputed this in Borgarting Court of Appeal! What makes the judgment against me a justice word is that the court has not dealt with what I and the heavenly blog are judged for, even though I disputed this in Borgarting Court of Appeal! Picture of Jan Aage Torp who tricked the police first with a fake review.Next, the right with false numbers and manipulation. Let me say that the sentence against me is an justice word.Why? Because what I'm convicted of has never been dealt with in court.It was not in the trial and it has not been dealt with in court. In other words, the judgment against me is and becomes an justice word. (screen shot of the sentence). Yes, there were some numbers they have used iniquity against me, what I have written and spoken. But it came out of a word shift and what is written and spoken against me and my family surpasses what I have written and talked to the narrator Jan Aage Torp many, many times.As well, it has come out of a word shift. Then it remains and remains a word of justice.When, for example, judge Øystein Hermansen writes that it seems like I'm conducting a persecution against the warlord Jan Aage Torp (picture) that's the lie.But what's worse than this is a lie, it's that it's never been debated in court what's what. Against circumstances, for what reason things have been said and what has been spoken and written against me etc.It is the word of justice of the times. Therefore, I have created this blog so that everything can be posted online what has been written from my side in this case.What the wizard Jan Aage Torp has written and his companions can be found on Torp's blogs and the website.Also on the fake Smyrna blog and on the downright site Searchlight.https://smyrnamenighet.wordpress.com/http://www.sokelys.com/This says Attorney Brynjar Meling in his ancestry:"The Court of Appeal has made the district court's description of fact the case by citing the three most important sections of the district court's reproduction of the fact on pages 3 and 4 of the Court of Appeal's judgment. As far as it goes, this description must therefore be taken into account, str.prl. § 306, second paragraph. (The lies of fool Apostle Jan Aage Torp build this judgment, which gives it zero credibility! ).Final Comment:In other words, it's not been a few minutes either in Oslo District Court to ask me and let me explain what and why it's written so much about Jan Aage Torp online.Neither in Oslo Tingrett and Borgarting Court of Appeal were done.That is because we have debated the miserable life of Torp seen from being an apostle.There what Torp himself and his disciples have both more chess higher than me in verbal words and expressions.And the amount is definitely three times as much from the "other" page!In other words, this is nothing but a word of justice!Almost all of this is manufactured. Not least that this has not been discussed in court. That is why I am obviously a conspiracy from Torp, the authority and the police!For example, I have never mentioned his new wife to the extent that Jan Aage Torp claims. And the word horebukk is almost not mentioned, and everything else is only undocumented claims by Jan Aage Torp. Who is as little credible as a person who is notoriously criminal or charged in another way!I was probably too naive and thought that when one came to a public dish, everything went right.But in fact, here it seems like being obscured in the back of the Norwegian judicial system.Both the judge of Oslo District Court, which was Malin Strømberg Amble, and her judges who were ordinary laymen and I do not name them.In Borgarting Court of Appeal there was judge Øystein Hermansen. Besides, it was team leader Bjørn Edvard Engstrøm and team leader Leiv Robberstad was a third man. These I name as they are public people.What has felt me ​​in two courts is not what I have written, but the amount of it. This is from the judgment against me and the heavenly blog:"It is a key point that defendants over a period of well over three years have published a hundred blog posts where Torp has been mentioned a very high number of times in terms such as" psychopath "and" leprosy ". The numerous blog posts and the review of Torp do not have the status of posts in a public debate, but appear as pure shikans without any purpose other than demolished Torp. The situation has little commonality with the core value that freedom of speech must protect, namely the free word change, cf. Rt. 2012 page 536 section 38. »This sounds so correct, but it's all a lie and distortion of truth on several points.1.) What is written about Torp is 98% written after his fictional review of me and the heavenly blog. Number and quantity is something that has come as a main point rather than anything else after his fictional review. In other words, Torp has notified me to get rid of me and the heavenly blog from the web, no matter how long he managed to get it done. Here's the word "goal sanctuary means"!2.) That I have counted the last four years written about 300 articles against me and the heavenly blog.I'm raining med over 20,000 messages against me also in the same period and over several years. It is clear that then there will be a large amount. 3.) The number of Oslo district court as well as the Borgarting Court of Appeal. Is a fictional number that Torp mentioned in Oslo Tingrett, which is entirely uncritical. There is no other who has neither contradicted him nor counted the number of votes. The number is for me completely beyond it, it is fabricated and a lie number. Jan Aage Torp is a skilled narrator and he has a lively imagination - giving him a prestige and an opportunity to reach his goal. Get rid of me and the heavenly blog, then he must have a legitimate judgment that has been his agenda and goals right from the start! 4.) The worst is not Jan Aage Torp, he is as he always has been. But the judges in Oslo District Court and Borgarting Court of Appeal. None of them has come up with a single question to me why it has become as it has become. About the number of votes and why I have written in as much amount as I have done. In other words, the judges of both of these two judicial institutions are in my eyes the door that judges me without wondering why it has become as it has become. Here we talk about a fabricated judgment, which does not stand out at all! No. 1700: Now the Romerbrev has been published by Carl Olof Rosenius as we have been granted permission to use arvent.net! Now the Romerbrev has been published by Carl Olof Rosenius as we have been granted permission to use arvent.net! As is said, on our website about Bible comments, seven contributors to the Bible Comments page. 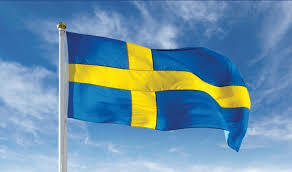 There are three Danes including me, an Irishman, a Swedish and two Norwegian. The Swedish entry is Romerbrevet issued by Carl Olof Rosenius, which we have been granted permission to use by arven.net! I have written several Bible remarks, and continue with the Gospel of John now. No. 1699: Updating Bible Comments on the Smyrna Oslo website! No. 1699:Updating Bible Comments on the Smyrna Oslo website! The author is the Danish priest C. Asschenfeldt-Hansen, Carl Christoph Julius Asschenfeldt-Hansen, 28.6.1856-127.3.1934, Priest. Born in Bov at Flensburg, death in Langå, Viborg county. A.-H. became a student in 1874 from Viborg, cand. teol. In 1879, he then learned from Refsnæs where he came close to the friends of Inner Mission, which led him into a religious crisis and a breakthrough that became decisive for his entire life.First look at Genesis, the rest comes eventually.http://janchristensen.net/bibelkommentar-hoved.php?side=bibelkommentarer-Forste-MosebokAnd Carl Olof Rosenius from Sweden Romerbrevet.I have also written a great deal, and more come.This has a typical Danish character over it. We bring the world's 2nd most beautiful flag after the Norwegian, Dannebrog.All books in the Bible, both GT and NT, have been published by the famous Bible poet Poul Madsen in Copenhagen Denmark.Poul Madsen, born January 21, 1916, died July 1, 2009, was a Danish cand.jur., Fictional Bible teacher, vocalist and founder of the Christianity Community, Copenhagen. Madsen published a large number of writings on the publisher "Mod Maalet", which also published a magazine with the same name. As well as the Bible overview of all the books in the Bible, both GT and NT.Of the seven contributors on the Bible Comments page. Are there three Danes including me, an Irishman, a Swedish and two Norwegian.In other words, the Danish feature is the biggest, but not bad the other either!C. H. Mackintosh, I have double comments on the books of Moses when I want C. H. Mackintosh to be still there. Charles Henry Mackintosh (October 1820 - November 2, 1896) was from Dublin Ireland. No. 1698: It is a big loss for Norway as a nation, and as a rule of law, that the case between me and the narrator and the warlord Jan Aage Torp never came up for the Norwegian Supreme Court! No. 1698:It is a big loss for Norway as a nation, and as a rule of law, that the case between me and the narrator and the warlord Jan Aage Torp never came up for the Norwegian Supreme Court! The whole trial was a dad, as it was the law that was most discussed, something that does not emerge from the judgment.In other words, the sentence is "made" for only one thing, to make me convicted, not for anything else!That this case was not discussed in the Norwegian Supreme Court, as after all, there could have been "real" negotiations.Not "sickly" and ridiculous as they were really here in Oslo Tingrett and Borgarting Court of Appeal. Blue. that what was discussed in court - law enforcement and almost only - does not appear in the judgment, which makes the case against me both absurd, embarrassing and an justice word!The court proceedings both in Oslo Tingrett and Borgarting Law Court were more like circus, not worthy of any Norwegian law. Picture of Tjostolv Moland (t.v.) and Joshua French (t.h.) in the court of Kisangani where they were sentenced only to Indians and Witnesses who believed something.Such was the judgment against me too, a big, big, big father, and more like a circus than a court where there were proper, honest and good discussions. When a matter like this leaves far more questions than answers, the judiciary has done a job!This writes wizard and narrator Jan Aage Torp about the matter and me:The convicted blogger (this is also a lie from Torp's side, I have only received a fine or a fine, nothing else and it has been paid a long time ago)The blogger fought against the police in Oslo Tingrett in January 2016. His appeal against the law enforcement (this is a lie again, I appealed the whole case) was rejected by Borgarting Lagmannsrett in April 2017 and then by the Norwegian Supreme Court in June 2017. Finally, the nail in the coffin came in November 2017 when the European Court of Human Rights in Strasbourg refused to deal with his appeal.Now Christensen tries to make himself a victim. He believes that he has had to shut down his latest blog because he and his family have been subjected to "harassment, persecution and liar". "The truth is, either, that the blog sooner or later would have to be closed because it produced more of the same" harassment, persecution and liar "as he has already been properly convicted of (it is also a lie, I no longer write a Torp is leprosy, psychopath and others, only that he is a prostitute as the word of God mentions him as. And a narrative as he, according to God's word, is disqualified to be all in the congregation of God through his horror and cruelty). "Amount Bullying»Of course, in our current case, this man is still on, believing that this will not have any further consequences. So unknowingly he is. He will get further and more powerful reactions.Money fines seem to have an effect. In our case, the convicted blogger was sentenced to a one-time fine of 12,000 kroner, alternatively prison for 20 days. This is probably a pit for him. But when the daily fines are paid out on a thousand dollar a day, the money will soon run out and flip: He chooses enough weekend breaks rather than daily fines! The judgment against the man is based not only on the content of the bullying, but also on the amount of bullying. Hence, the term I have launched: "Mengemobbing". It's a difference if you write or say something bad and punishable once, than if you say something bad and punishable in weeks, months and years! 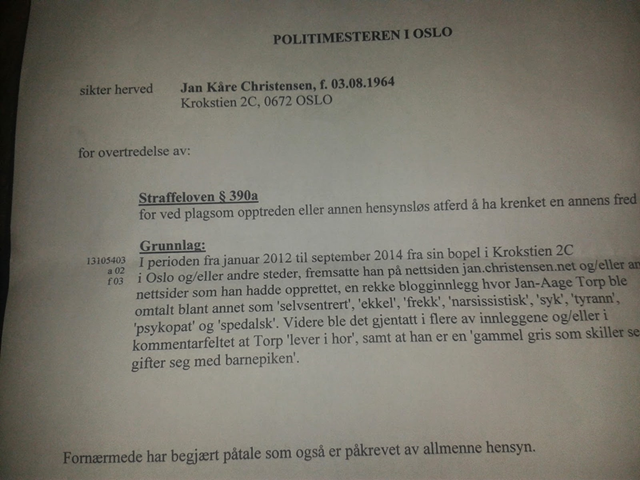 The "Fillesaken" against the blogger has proved to be far wider. The verdict has brought in a new dimension in the ruling in Norway, which not all "bullying" had counted on. In the sandbox, the "mobs" keep on until they get clear restrictions, and so it must also be in the adult world. (quote ending). Here is a lot of facts wrong and lies!Nothing in the judgment says anything about what is the "limit" for writing.Nothing in the verdict talks that it does not and can be written and spoken more.Nothing in the verdict speaks and says something about which law has been violated specifically, as the judgment itself is "fabricated" and lies "It is of course a justism word, but also a judgment that is not worth the paper it is written on!What does the judgment say?Actually nothing, except I have not really done anything criminal. But since it is written "too much" and they want to state an example, I am judged to pay an item and costs of a total of 15,000, - for not doing anything wrong, except to write too much so that It looks like a vendetta against Torp.That he has written a lot, and his companions Ansgar Braut and Torodd Fuglesteg have written far more and far quasers are not included in the verdict as the verdict suffers from not having been discussed under the court.It's an "adventure" and "swallow" them, nothing else!Final Comment:Narreapostelen has launched a new "slogan" after the verdict against me and the heavenly blog.It is the word "Mixing".But it was wrong with all this judgment that during the trial this matter was not discussed, there was something that appeared when Judge Øystein Hermansen and judge Malin Strømberg Amble who wrote the verdict did not even ask me about what they judged me. But I clearly stated during the court proceedings in Borgarting Lagmannsrett that Torp's numbers were completely beyond and not documented. The whole trial was a dad when it was law enforcement that was most discussed, which is not the case at all. In other words, the sentence is "made" for only one thing, to convict me, not for anything else! That matter was not dealt with by the Norwegian Supreme Court , as after all, there could have been righteous negotiations that had been proper. The court proceedings both in Oslo Tingrett and Borgarting Lagmannsrett were more like a circus, not worthy of any Norwegian law. Today, this judgment is something that has zero value, only value to see how bad it is possible in Norway to take legal action. The judgment testifies to one thing, Christian hatred from the community against Christ and his servant! Nothing but saying that it was a sad blackie there, even if I'm doomed, the verdict does not really tell the world's things. It only confirms the contempt of man for God and Christ Jesus, with the narrator and wizard Jan Aage Torp in the lead (the picture). Except that this is the word of justice of the times! No. 1697: Both editor Alf Gjøsund in the newspaper Vår Land and editor Finn Jarle Sæle in the newspaper Norway today defend the verdict against me as they both really do not want to understand that the sentence against me is an abuse of Norwegian law! No. 1697:Both editor Alf Gjøsund in the newspaper Vår Land and editor Finn Jarle Sæle in the newspaper Norway today defend the verdict against me as they both really do not want to understand that the sentence against me is an abuse of Norwegian law! Picture of Alf Gjøsund who tries to be a judge, a prosecutor and a lawyer for Torp in the case between me and him, not bad.But Alf Gjøsund only shows here with Finn Jarle Sæle's Christianity.Only one who has supported me in the sense that he believes it is not a criminal offense to write to a writer, ala Jan Aage Torp, is editor of the newspaper Dagen Vebjørn Selbekk (photo), if he supports your partial lukewarm! Once I have been judged, the greatest justice word in Norway is in several ways. 1.) What I'm convicted of, "crowd-writings" has never been dealt with by the court. It was not even in the trial. 2.) The law that is used to me talks about completely different relationships than what it is used to against me. Therefore, the case is against me both a father and a justice word. This writes my very good lawyer Brynjar Meling. Under section 18, the Supreme Court comes with its view. As the Court of Appeal points out, the starting point for the assessment must be the requirement for clear legal authority in criminal cases, cf. the Constitution Act 96 and the ECHR Article 7. Reference is made to Rt-2011-469 Section 9, cited in the Appeals Court's ruling. "It is nevertheless not decisive what the legislator might have meant when any legislator's intentions have not been clearly expressed in the law. I refer to the statutory requirement of the Constitution § 96 and in Article 7 of the ECHR, as understood in, inter alia, in Rt-2011-469. Of particular interest are sections 9 and 12 of the judgment, which emphasize that the punishment must comply with the law and that lack of support in the wording is not remedied by the fact that the relationship is clearly punishable and that the legislature undoubtedly wanted to hit it. In the alternative, if the Court of Appeal claims that the statements violate privacy, after a general interpretation of the statutory provisions in force. § 390a, and that the district court has not extended the interpretation of the statements in a manner contrary to Article 7 and Article 8 of the ECHR. § 96, it follows from strl. Section 1, second paragraph, that the consideration of Christianity's rights - and our obligations - according to the ECHR and SP on the preservation of the individual's freedom of religion and expression, imply that strl. § 390 a) in cases where religious and expression freedom is violated, must be interpreted restrictively. (quote ending). The judgment against me is like Meling writes an abuse of law enforcement. Here is what editor Alf Gjøsund writes in the newspaper Our Country. We can not expect people who fear unwarranted online attention to emerge from the digital reality. A COURSE case of great importance has reached its end station in the Norwegian judicial system. The Supreme Court has ruled the verdict of the Court of Appeal against Jan Kåre Christensen, who for several years has shed pastor Jan-Aage Torp on his blog. Borgarting Court of Appeal ila Christensen a fine of NOK 12,000, and this verdict is now enforceable. CHRISTIAN'S RESPONSIBILITIES Brynjar Meling believes that there should never be an accusation under the Criminal Code, as no-one has forced Torp to read what is on the blog. Instead, Torp should have gone to court action if he felt violated by the statements, according to the lawyer. The Penal Code only affects "The one who, by frightening or disturbing behavior or other reckless conduct, pursues a person or otherwise violates another's peace (...)". However, by virtue of his rejection of Christensen's appeal, the Supreme Court states that the relevant section of the Criminal Code may apply even if the statements are not addressed directly to the said. This is a reasonable approach and signals an updated understanding of a text that has roots back to a time when no one had heard about computers. "USING blogs is common and there is a need to provide protection against ruthless behavior through the use of the Internet," the judgment states. "The Court of Appeal emphasizes that a blog is publicly available on the internet for everyone. Christensen's blog was intended to be spread within a particular religious environment. It must be assumed that Christensen was aware that his statements came to Torp's knowledge, as Christensen also wanted. " The mention in the unregulated part of the net must go to litigation instead of the prosecutor's charge. This is what editor Finn Jarle Sæle wrote in the Norwegian newspaper today. Closure of the Persecution of Persecution! The Supreme Court, in its appeal committee, rejected on June 21 The appeal from a blogger who went hard and persistent with personal prejudice. Thus, unanimous judgments in Oslo Tingrett and Borgarting Court of Appeal will be held for years long by the pastor Jan-Aage Torp and his wife, confirmed by the Supreme Court. It is wise to go up frontiers here before it is too late. The Supreme Court ruled that the blogger's overall blog production is not a matter of factual and religious criticism, but rather "harassing and harassing persecution of Torp." 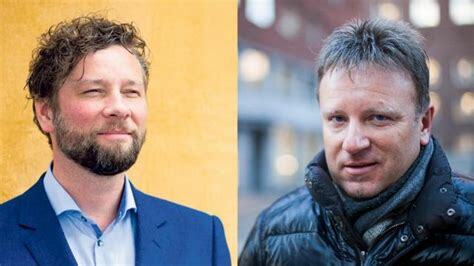 The magazine Kapital presented on the first page the convicted blogger's battle against Jan-Aage Torp, and Torp said: - The District Court judged the blogger unanimously 3-0. The Court of Appeal confirmed the verdict 3-0. It is not allowed to pursue prosecution and harassment! - An almost 3-year battle to stop the blogger's shaman has led to a ruling in all courts in Norway. Other people who are being harassed in the same way can now show a unique sentence that can be used to stop online roaming and NRK focal points. You can also demand that the search engines remove this schan from their search algorithms. We can all thank you for this. Final comment: Per Sandberg and his boyfriend Bahareh Letnes have been writing so much for several weeks that what I have written and talked about Torp, even though it has been a word shift. Is like a drop in the ocean. The contrary, just shows how absurd, wrong and misleading it is. The thing against me is ridiculous, primitive and erroneous. I have never threatened Torp ever, or sought him in somebody's way. Anyway, it's which is the basis for the verdict as if I have done this. It merely shows that the verdict against me is totally wrong, false and a fairyword! Think, Per Sandberg has it been written over the last few weeks and spread what VG, Aftenposten, Dagbladet and everyone else what they think of him. Read the comments, what I have written about Torp, who is also a public person, is like "peanuts" against what Sandberg is called. Is this law? Is that what I have written law? Even though it's like a drop in the ocean, what does it say about Sandberg? Yes, everything is law. But I'll be judged and taken, but not anyone else. Why? It is religious and Christian persecution against me and the heavenly blog! No. 1696: The collection check shows its incapacity to blacklist us! The collection check shows its incapacity to blacklist us! They have contacted me again 2 years ago, and then I gave the same answer. We do not go with the funds collected, so there is no reason for anyone to have access to anything.Of course, the tax authorities get all the information they request. After all, I'm Norway's most law-abiding citizen, as my father was, he-he!But I believe in Jesus and the Bible, then one must also count on persecution and everything else that accompanies.You can of course support us. But I regard prayer as more important than money, and that you talk well about us! Need prayer and support for further work and service, do you want to join? Be blessed in the Name of Lord Jesus Christ!The possibilities are many, but then we must stand together and help each other in the future! No. 1695: Kristen Koalisjon Norway is a "movement" with two faces! No. 1695:Kristen Koalisjon Norway is a "movement" with two faces! 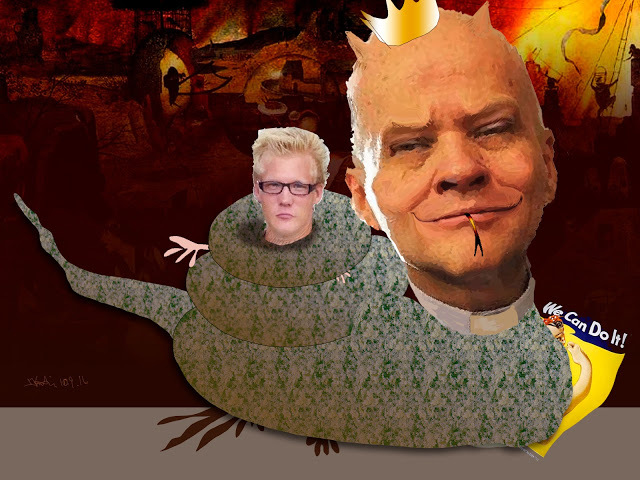 Picture of Narreapostel and Horkarlen Jan-Aage Torp who treats his own children in the worst imaginable way with demon demolitions, and steals millions of others he calls to be sick afterwards. 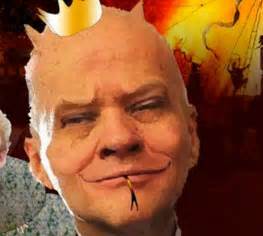 The man is both dangerous and crazy!Horkarlen Torp wrote that he was a reprieve of the innocent. When I asked who of his or her former wife was the innocent, when both are now reissued, I never received any answer.The theory of the so-called innocent can marry again is completely absurd, it is only death that allows a believer to marry again. Christian Coalition Norway is a very dangerous and straightforward, so-called Christian movement. Brings an article to the end of "A Marriage - Once" by Ruth Silje Johansen. Older people had the opportunity to get acquainted with her and they often prayed for her during this period. When I had a trip south and visited her, they sent me a video called "The Fight for Marriage." She sat down to see it right away. A woman and a man told her story about divorce and reunification. She got shock, can you be reunited after a divorce? As she watched the film, her heart was filled with hope and relief tears ranted in hot currents. The married couple made it clear that it was the evil that hated everything God had created and ordained and split my mother and father. From that day on, both my and her views turned to marriage. She had promised to be faithful in good and evil days and those days that have now become a year are the evil days in her and dad's marriage. My father still called a Christian, but was not active like before. Should she just put her shoulders and say; "Well, Satan has stolen my husband and destroyed my family and I can only find myself?" No! She will fight to take back what the evil has stolen! She said my husband is MIN. Marriage is until death separates us. Jesus teaches us that the right spirit is; If you are unfaithful, I am faithful. That's how we can be. We can choose to keep our part of the spouse even if the other spouse does not hold it. To love those who love me back is not particularly difficult. But Jesus even commands us to love our enemies. Now she can do nothing but to love my dad in peace and quiet. He shows no interest in reuniting and having a girlfriend with whom he lives. So this has been my starting point to get an interest in investigating for myself what God's word says about the divorce, divorce and remarriage. I have gone from being indifferent, because it's fine that I do not know where I am today and I will try to put a word on here. 3Hva says the word of God A few decades ago divorce was rare in the church. Now it is difficult to find churches where there are not many divorces and the need to take these bible words in the preaching should be great. But it is not often that I have heard a clear announcement that marriage is until death separates us. 1 Corinthians 6,9: "Or do you not know that those who do injustice do not inherit the kingdom of God? Do not want to be! Neither horrorists nor idolaters, or marriages, nor those who can be used for unnatural executions, or men who work out with men ... shall inherit the kingdom of god. " 1 Thessalonians 4: 2-8 You know the commandments we gave to you through the Lord Jesus. For this is the will of God, your sanctification: Keep away from horror. Each of you must know to win his own spouse in holiness and honor, not in passionate desire such as the Gentiles, those who do not know God. No one must deceive or exploit his brother in what he has with him to do. For the Lord is revenge over all such things. We have also said this before you and testified to you. For God did not call us uncleanness, but for sanctification. Therefore, he who despises this, does not despise a human being, but God, who gives His Holy Spirit to you. In most cases, this scripture is used to find a spouse. It is, however, about how to win your own spouse. The one who is already yours. The spouse you have already married. We are actually called to daily win favor, kindness and heart to our spouse. God who established the marriage is already aware that the race has not been won when you found him or her. That is when life begins. Marriage commencement consists of both visible and invisible elements, that is, both the physical ceremony and divine intervention. It is symbolic in the sense that it has an outer shape that illustrates the inner, but it is the inner event that is central; Symbolism is just a means of receiving this enormous task with the right setting. Perhaps it is true that God did not give us a spouse because we should be happy, but because we are sanctified through marriage. We are sharpening each other to become more like Jesus. 5 Ephesians 5.31-32: "Therefore, the man shall leave his father and mother, and stay with his wife, and the two shall be one flesh. This secret is great - I speak here about Christ and the church. " Marriage is a picture of Christ and the church. The world should look upon us Christians and say, "See where they love each other!" Our marriage should be a visible picture of the love between Jesus Christ and his bride, the church. Romans 7: 4 My brethren! So you also died from the law of the body of Christ, that you may belong to another, who was raised from the dead, so that we may bear fruit to God. What is the reason for this important detail in the word of God is that Christ and the church should be a model and example of marriage. Just as Christ became the spouse's spouse by the death of death, only death separates one spouse from the other. This strong picture is perfect because no one can separate us from Christ. we are in sin! God's covenant with us is that he never leaves us. Through the Pact, we are as inextricably linked together and this covenant is the image of Christ's faithfulness to us. We are as inextricably bound by our covenant to our spouse as Christ and the church are linked. Jesus' successor can not accept God's word, then one will also come on a collision course with He as a day to judge living and dead. The Lord Jesus is one with his word and He is yesterday and today the same.